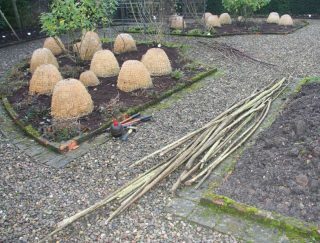 Plant supports built from hazel and willow are an attractive and inexpensive alternative to commercially purchased structures. Fortunately, a large portion of our 40 acres of woodlands are part of an old hazel coppice along the escarpment. Every year, around 10% of the hazel is coppiced as part of our woodland management. 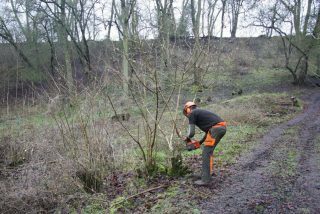 While the majority of the coppicing on the steep slopes is done by woodland contractors, a small area, which is accessible from a tractor-friendly track, is reserved for our own “harvest”. We use the collected material for various purposes at the end of the winter. However, our first project is to build supports for our Gallica and Alba roses which flower on last year’s growth and are therefore not pruned in the winter. Because of their height and lanky habit, they have a tendency to bend under the weight of their blooms if left unsupported. 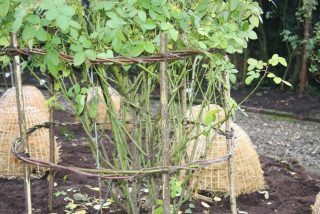 The supports are built from sturdy, straight hazel stems and thin, bendy willow branches, tied together with garden twine. 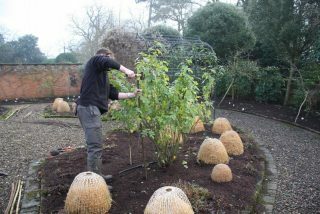 First, four to six hazel stems are driven into the ground as vertical “posts”. 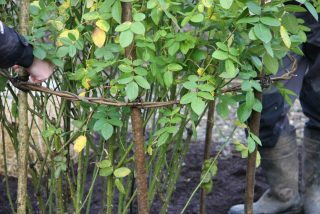 Next, two or three willow branches are twined around each other and connected end-to end with similarly intertwined branches to obtain a sufficient length for a horizontal willow “hoop”. 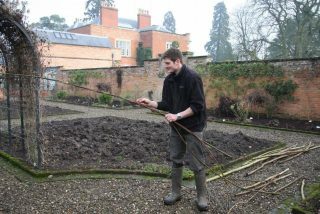 The willow hoops are tied to the hazel posts on two levels for increased stability. The final supports are quite robust and can withstand even high winds. We usually replace them every other year.